The 2018 blueberry season has ended. You can still purchase frozen blueberries — just call to schedule a time: (219) 956-3687. 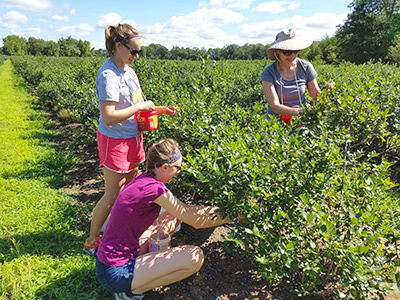 Be sure to follow us on Facebook for updates on the 2019 U-pick blueberry season! Come pick your own blueberries and make it a family experience! Blueberry picking is fun, healthy, and provides great photo opportunities with the kids, too. Relax under one of our shady oaks and enjoy your picnic lunch at one of our picnic tables. No time — need blueberries in a hurry? We also offer fresh-picked berries in our Red Barn Farm Stand at the entrance to the fields. You haven't experienced a blueberry if you haven't had them fresh picked for you from the field! Call ahead for orders. Our honey bees pollinate our blueberries and produce delicious honey! We sell our honey in one-pound and three-pound jars, in the Red Barn Farmstand at the entrance to the blueberry fields. 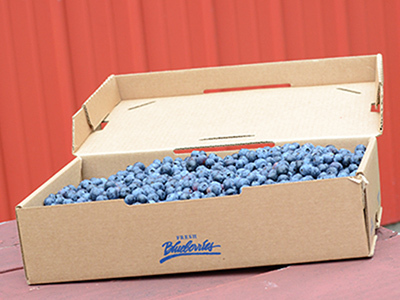 Since 1943, the Van Kley family has been growing juicy varieties of blueberries that simply melt in your mouth. This second-generation blueberry farm has 8 luscious varieties on 32 acres. Visitors from Chicago, Indiana, and around the Midwest make the pilgrimage to Wheatfield, Indiana every year to enjoy our blueberries. Our blueberries come from labor intensive plants that have taken many years to reach maturity — it takes a decade from planting until full production levels have been reached. We irrigate our blueberries when necessary to provide the sweetest largest berries available. Our berries are also naturally pollinated by our own honeybees. Every year, we tend our own honey bees. These bees do double duty. They provide natural pollination for our blueberries, and they also provide the wonderful honey that we sell in our Red Barn Farmstand! Blueberries are loaded with antioxidants, fiber, and vitamins. They're believed to combat inflammation, protect the brain, and regulate digestion. Pick plenty of berries — remember you can freeze them and enjoy the health benefits and delicious flavor all year long!